Please ensure you have read the requirements section. Internet access is required during installation. You will be prompted for valid network settings during the installation process. Download the latest USS Gateway software image. Use Windows Explorer or CDBurnerXP (free) to burn the software image to CD. Insert the CD into the physical server. Ensure the BIOS is set to boot from the CD first. Power on the server and follow the installation steps below. Create a new virtual machine matching the requirements. Attach the .iso file to the virtual CD on the new virtual machine. Ensure the virtual CD drive will connect at power on. Power on the virtual machine and follow the installation steps below. The installation wizard is keyboard based. Use the cursor keys for menu navigation, Tab to switch options and Enter to select. 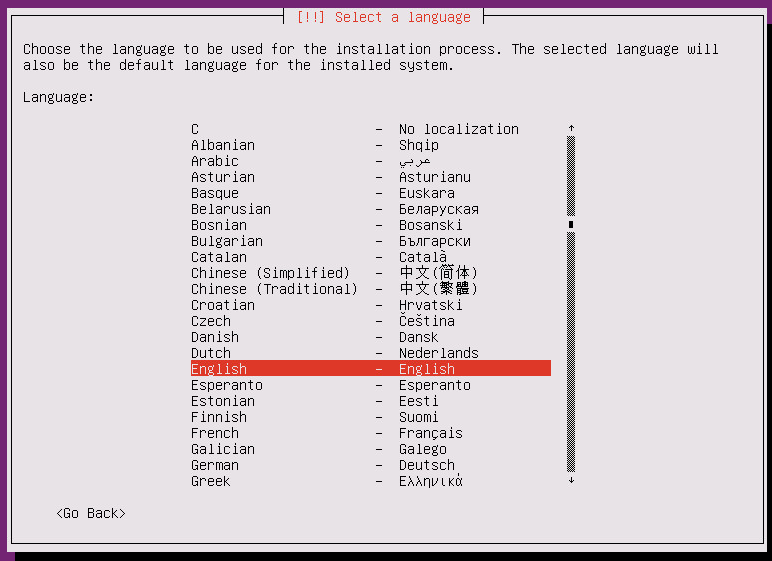 Once the server has booted from the installation CD you will be prompted to select the language to use. Select the appropriate option from the list and press Enter. The USS Gateway splash screen will be displayed. Press Enter again to start the installation. The console-based installer will appear. To select options use the CURSOR KEYS, to move between options press the TAB key and press ENTER to confirm your selection. Select the desired language and press Enter. Select the geographic location where the USS Gateway server is located and press Enter. Next you will be prompted to detect the keyboard layout. Press Enter to skip automatic detection. 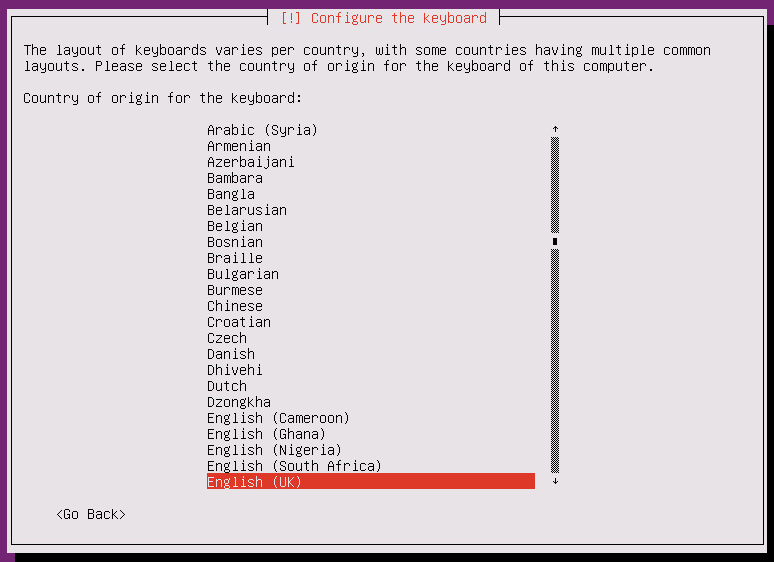 Now select the correct country for your keyboard from the list and press Enter. Next select the best layout that corresponds to your keyboard and press Enter. The installer will now copy files required for installation. This process can take up to a few minutes depending on the speed of the machine. Once complete, you will be prompted to enter a static IP address for the USS Gateway server to use on your network. This should be a LAN address. Type the IP address in one of the supported formats and press Enter. 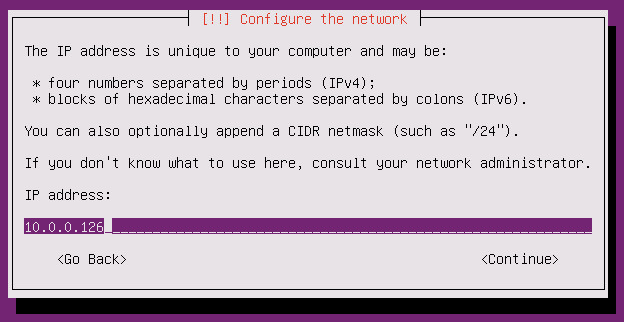 You will then be prompted to enter the subnet mask for the network. Enter the correct subnet mask and press Enter. Next you will be prompted to enter in the default gateway. Enter the default gateway and press Enter. Next you will be prompted to enter in at least one valid DNS server. You may enter up to three DNS servers separated by spaces. Press Enter. All of the entered network settings must be valid so that the installer can download files via the Internet. Next you will be prompted to enter a hostname for the USS Gateway server. This will form part of the Fully Qualified Domain Name of the server if you join it to a Windows domain later on. The hostnames can be changed later if required. If you are deploying multiple USS Gateways then these hostnames should be unique. Enter the hostname and press Enter. Next you will be prompted to enter in the domain name for the USS Gateway. You can enter your Active Directory domain (e.g. domain.local) or if you do not use a domain simply enter uss.local and press Enter. For security, you are required to create an operating system user account for the USS Gateway. This allows you to access the command line directly for system maintenance tasks (if required). Enter a suitable real name for the account, such as "System Administrator" and press Enter. Next you will be prompted to create a username for this user. Make a note of the username and keep it safe - this username is used for maintenance, technical support and upgrades. Type in a username and press Enter. Next you will be prompted to enter a password for the username. A good password should contain a mixture of letters, numbers and punctuation. Make a note of the password and keep it safe - this password is used for maintenance, technical support and upgrades. Type in a password and press Enter. This is not the username and password that will be used to administer the USS Gateway web interface. Refer to the Configuration Guide for information on how to associate this USS Gateway with a USS account. You will be prompted to re-enter the password. Re-enter the password and press Enter. Next, the installer will attempt to guess the time zone. If the time zone is correct, press Enter. Otherwise use TAB to select NO and select the correct time zone. The installer will now prompt to create partitions on the server hard disk. This step will erase all of the data on the hard disk and install the USS Gateway operating system. Confirm again that you agree to ERASE ALL DATA FROM THE HARD DISK. Press TAB to select YES and then press Enter. The USS Gateway operating system will now be installed. This may take several minutes. The installer requires Internet access to download files. Before attempting to download files, the installer will prompt to confirm if a web proxy server is required on your network. If your network requires a proxy, please enter it in the format shown (it is important to include the http://) or simply press Enter if no proxy is required. If the process fails after this step for any reason please refer to the troubleshooting section at the end of this guide. Next, the installer will prompt for managing updates. As the USS Gateway is often a production server, it usually makes sense to disable automatic updates, as they can restart services which could impact users of the USS Gateway system. Press Enter to select "No automatic updates". The installer will finish configuring packages. Finally, you will be prompted to install the boot loader. Press Enter to continue. The installer will finalise the system. The installation will then finish and you will be prompted to remove the installation CD from the drive. The server will then reboot. Press Enter to finish the installation. After the reboot, the console will show the command line log in prompt. You should now continue by following the post-installation Configuration Guide. Please review the post-installation Hyper-V notes before continuing. If you encounter problems with the network during installation please attach the Legacy Network Driver to the virtual machine and retry. The most common cause is the installer is not able to download the required files - usually due to DNS or gateway problems. Ensure the network details are correct and the virtual machine has access to the Internet. You should exit the installer and start again to change the network settings. If you have to use a proxy server ensure it has been entered correctly, starting with http:// and containing the port number and a username/password if required in the right format. Ensure no other security appliance on the network is blocking the installer.